WYSIWYG enables an user interface which allows user to view exact to the end result while the document is being typed. WYSIWYG can be a Software or a device. WYSIWYG stands for What You See is What You Get. Today the term WYSIWYG is mainly used to indicate a software. The first usable WYSIWYG device was set-design-Terminal (SCT), developed by an Austrian company. SCT was able to directly convert a properly show on screen page in a set of commands for Linotype phototypesetting machine. The 1990’s term WYSIWYG, softened by a number of software programs in which the output document will look just as similar as during processing. Especially for HTML editors the term WYSIWYG, strictly speaking is incorrect, since the output of an HTML page may vary and may depend on the installed system fonts and therefore greatly vary from viewer to viewer. WYSIWYG is used by programmers in addition to the editors and by content management systems like WordPress and content management systems enable editors to edit Web pages without any knowledge of HTML. Often there are difficulties in implementation between written text and illustration, therefore a simplified markup language used. Many WYSIWYG editors do not require the knowledge of programming language or Markup. Some software store the generated pages in a proprietary format and export as HTML. Generally simpler WYSIWYG editors are designed to work directly with HTML files. ASP.NET Web Matrix, Adobe Dreamweaver, CoffeeCup HTML Editor, Microsoft Expression Web, SiteGrinder, Opera Dragonfly, KompoZer, iWeb are few examples of such WYSIWYG Editors. However, it is said that, hand coded pages are more dependable than these Editors due to insertion of artifacts. This Article Has Been Shared 8289 Times! PostgreSQL is an object-relational database management system (ORDBMS) available for many OS including Linux, FreeBSD, Solaris, Microsoft Windows and Mac OS X.
Customize OS X 10.8.x Dock with own graphics either manually or using a Free Software. You can restore to defaults at any point. Here is how. 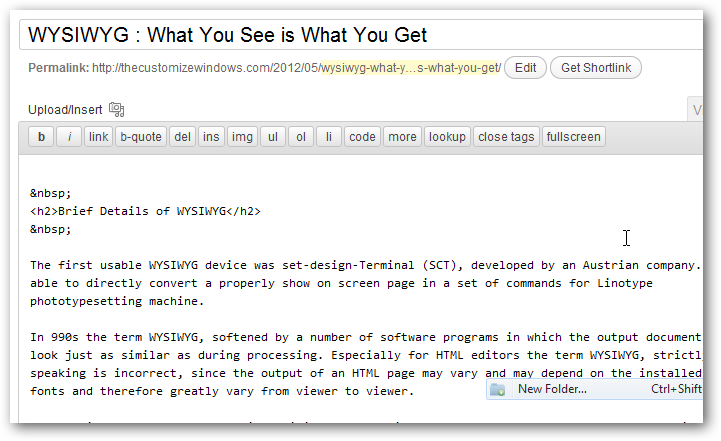 Cite this article as: Abhishek Ghosh, "WYSIWYG : What You See is What You Get," in The Customize Windows, May 28, 2012, April 18, 2019, https://thecustomizewindows.com/2012/05/wysiwyg-what-you-see-is-what-you-get/.